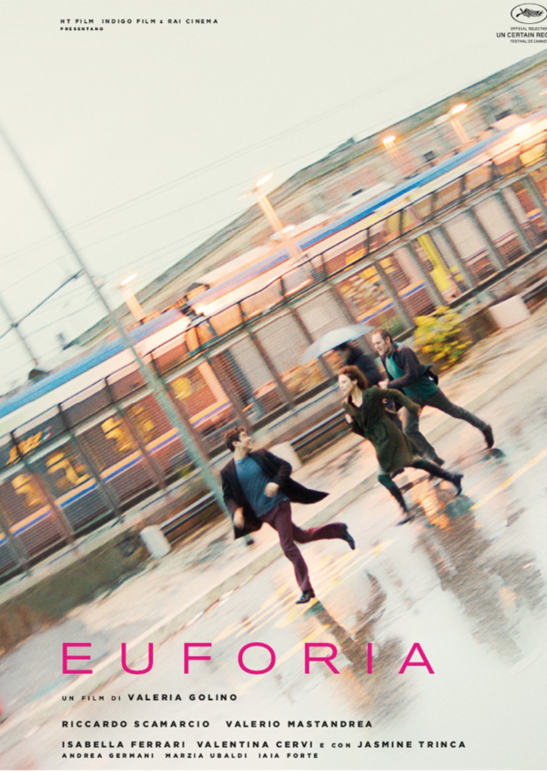 For this edition of the renowned Festival, Award-winning actress and director Valeria Golino will be our guest of honor during the screening of her film Euforia along with Director Julie Taymor and Novelist André Aciman. Special guest director Paola Randi will present her movie Little Tito and the Aliens. Italy’s premiere film festival, Italy on Screen Today, announces it will make New York and Miami its home this December. Bringing the best of Italian contemporary cinema to America, the Festival will feature American premieres, great authors, young up and comers of direction, and the most iconic faces of cinema. Starting on December 8th and running through December 11th, Italy on Screen Today New York - on its third edition - will consist of several screenings in multiple locations across Manhattan, Long Island, and Brooklyn. Key screening sites include the NYIT Auditorium on Broadway and New York University’s Casa Italiana Zerilli Marimò in Manhattan, Stony Brook University in Long Island, and Williamsburg Cinemas in Brooklyn. Italy on Screen Today was launched in 2016 by Loredana Commonara, who is also the event’s artistic director, with the support of Cav. Giuliana Ridolfi Cardillo. The event is organized by the Cultural Association Artistic Soul (Associazione Culturale Artistic Soul) which has been promoting Italian and international cinema for nearly 25 years. Italy on Screen Today New York & Miami is a result of the contribution of the Ministry of Cultural Heritage and Activities - Directorate General Cinema. The following organizations also support the event: the Italian Consulate of New York and Miami in collaboration with RAI Cinema, Italian Heritage and Culture Committee of New York, Italian Cultural Institute of New York, Roma Lazio Film Commission, Miami Beach Cinematheque, New York University, and Stony Brook University. 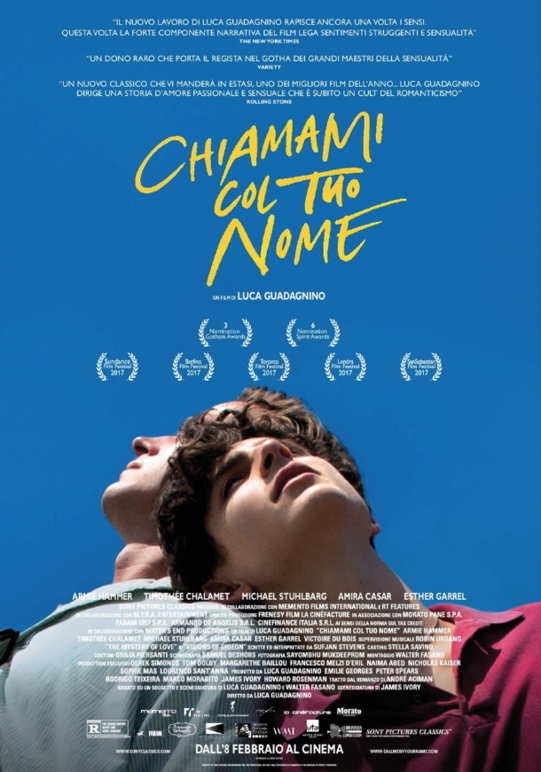 This year, Italy on Screen Today is honored to host Award-winning Volpi Cup at Venice Film Festival actress and director Valeria Golino who will discuss her last directorial work Euforia with journalist Silvia Bizio, American Novelist André Aciman with whom we will discuss the themes of his award-winning novel Call me by your name that inspired the acclaimed movie directed by Luca Guadagnino, and Academy Award-nominated director Julie Taymor who will join us to discuss her incredible directing career. They will be honored with the prestigious Wind of Europe International Award. 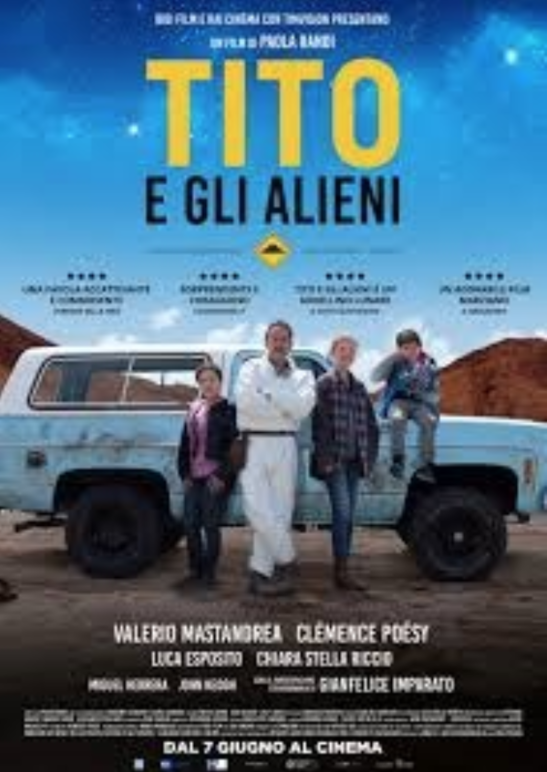 We will also have special guest Director and writer Paola Randi, who will guide us through the screening of her second feature, Little Tito and the aliens, a Sci-Fi feature that will make you laugh and cry, with many surprising elements. Italy on Screen Today 2018 will include also the following features: Una storia senza nome by Roberto Andò, La profezia dell’Armadillo by Emanuele Scaringi, L’intrusa by Leonardo di Costanzo, Un giorno all’improvviso by Ciro D’Emilio, Il ragazzo invisibile seconda generazione by Gabriele Salvatores, Sono Gassman! Vittorio re della commedia by Fabrizio Corallo screened at Stony Brook University in Long Island. Il colore nascosto delle cose by Silvio Soldini, Una famiglia by Sebastiano Riso, Frida by Julie Taymor screened at Williamsburg Cinemas in Brooklyn. 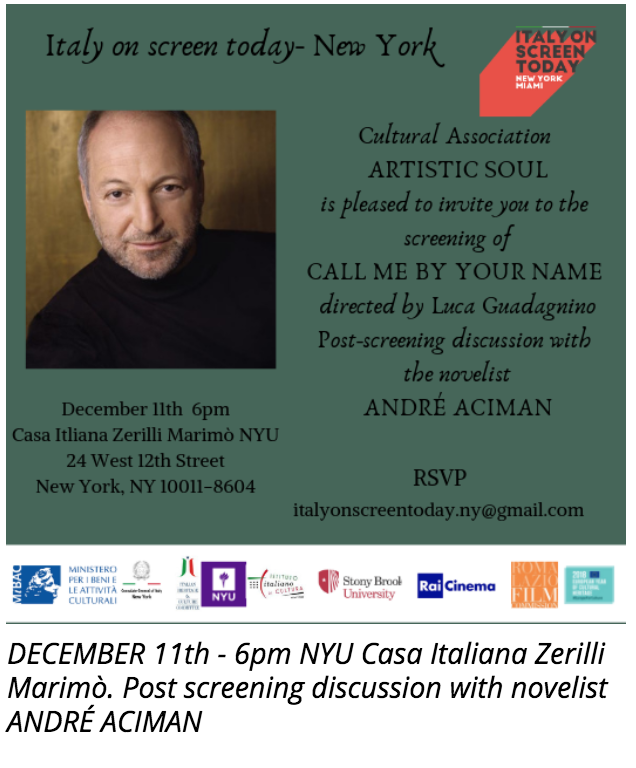 Call me by your name by Luca Guadagnino and Tito e gli alieni by Paola Randi at NYU Casa Zerilli Marimò. The Festival will close out the US tour in the Miami area on December 14th and 15th with screenings at the LauderArt in Fort Lauderdale. 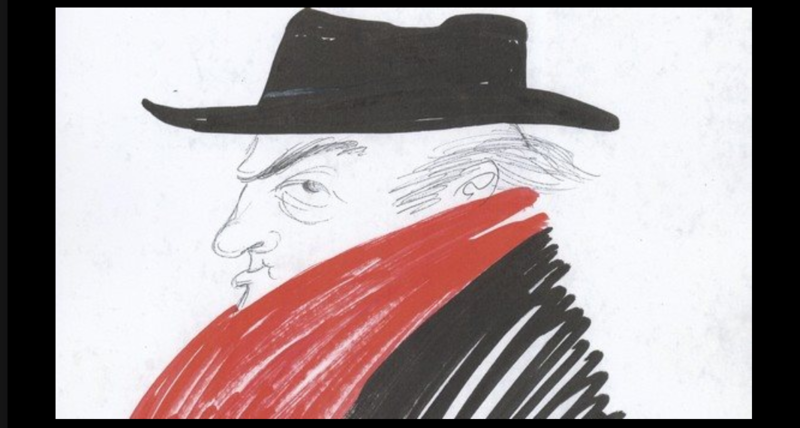 Italy on Screen Today Miami will also feature six additional contemporary works by Italian authors and it will be dedicated to the great icons of Italian Cinema: Federico Fellini, Ettore Scola, Vittorio Gassman, Mario Monicelli, Sophia Loren: Muse e Dei by Gianfranco Lazotti, Ridendo e scherzando: ritratto di un regista all’italiana by Paola and Silvia Scola, Donne nel mito - Sophia racconta la Loren by Marco Spagnoli, Monicelli. La versione di Mario by Mario Canale, Annarosa Morri, Felice Farina, Mario Gianni, Wilma Labate, Sono Gassman! Vittorio re della commedia by Fabrizio Corallo, Che strano chiamarsi Federico by Ettore Scola. Directed by Valeria Golino starring Riccardo Scamarcio, Valerio Mastandrea, Isabella Ferrari, Valentina Cervi, Andrea Germani. Italy 2018 – 115 min. Matteo is a young successful businessman, audacious, charming and energetic. Ettore instead, is a calm, righteous, second grade teacher, always living in the shadows and still in the small town where they both grew-up. He is a cautious, honest man who has always held back a little, sticking to the shadows, for fear of making a mistake. They are brothers but with opposite personalities, they would appear to be very different as people. But life forces them back together and a difficult situation results in them getting to know and discover each other, in a vortex of fragility and euphoria.